Even cloudy days offer a spectacular view over the huuuuge gorge. 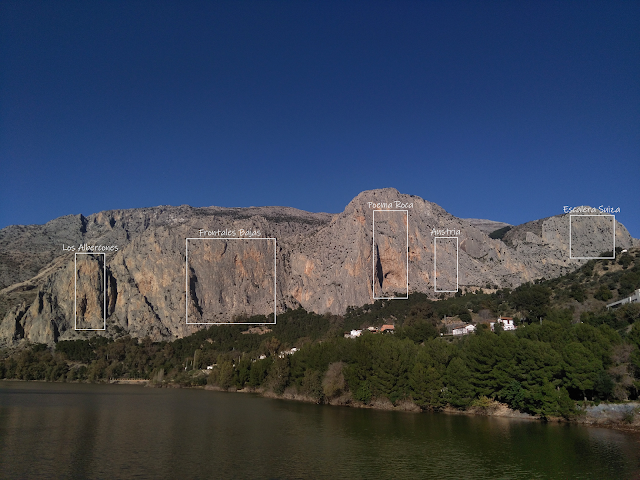 When you go to Verdon, you need to be well prepared. It isn't the right place to introduce yourself to rock climbing or at least multi-pitch climbing without an experienced guide. Seriously. 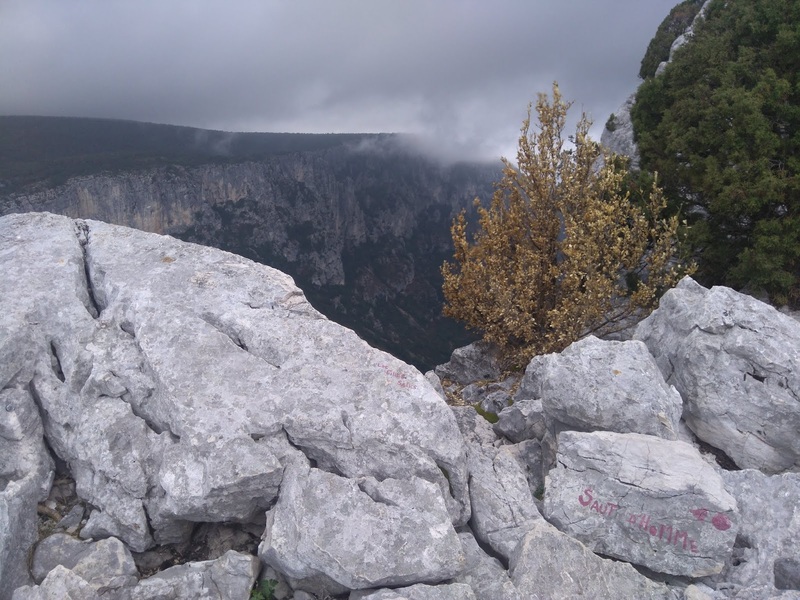 It's an over 300-meter fall in places, there are most likely a bunch of other people climbing too (which always makes things more complicated) and if you can't make it out of the gorge by climbing, you need to hike for several hours in pretty demanding terrain. We ended up in a rain of rocks on a busy day and were very lucky to have our helmets on. Helmets and twin ropes are obligatory in Verdon! A guidebook comes in handy too, and you can buy one at the climbing shop in La Palaud Sur Verdon. Le Perroquet Vert is located along the main street and is very easy to spot. Le Perroquet Vert stands for "green parrot" and there's of course a green parrot on their logo. It's a quite well equipped shop, but a bit expensive. If you need some basic climbing equipment, you might want to stop by at Decathlon before going to Verdon. There's also a small grocery store in the village, but the selection isn't that good and prices are high. Fortunately, at least water is free and you can get it from a green tap near the climbing shop and grocery store. Once you get the hang of things, climbing in the gorge is superb. Chlorochose (5c) served as great introduction for us. 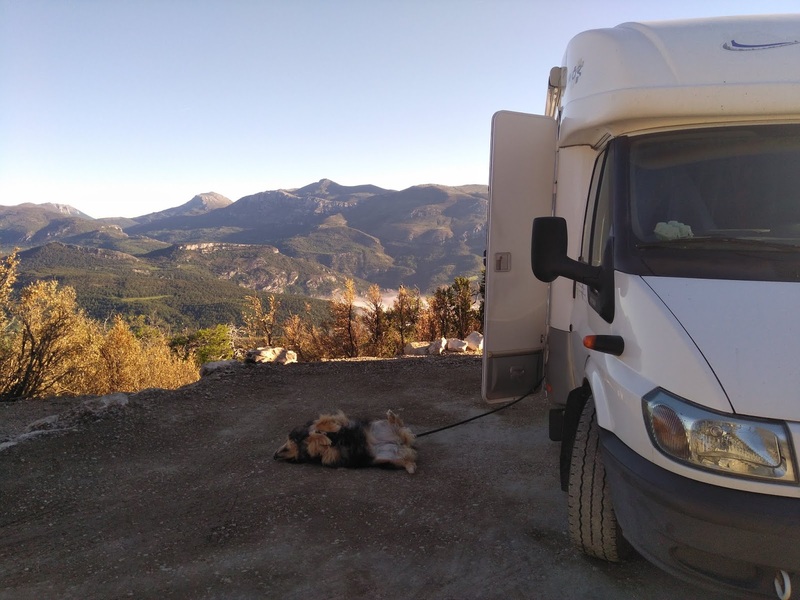 We arrived to Verdon around 8 o'clock on Thursday evening, visited the climbing shop, bought the topo and asked for a super easy and yet enjoyable multi-pitch route. 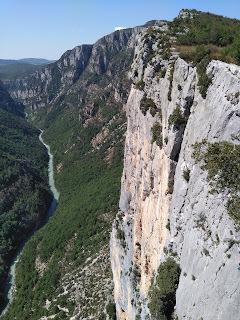 In the next morning before noon we were at the Dallas Grises rappelling anchor, ready to start our Verdon-experience. It was only a 5-minute walk from the Carelle viewpoint (we spent the night there) to the rappelling anchor, that was very easy to find. 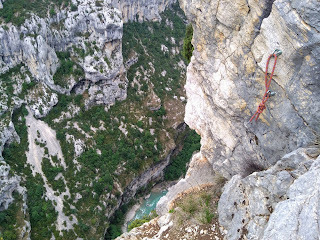 Rappell to Jardin des Ecureuils was easy, too. And the climbing? Quite nice. Definitely not too hard, and you can scramble up the 150 meters in a comforting corner all the way. Our dog enjoying a quiet morning in the mountains. Gradewise, there's something for everyone around the Escales area. Ticket Danger (6a+ if you skip the first pitch) was one of the most enjoyable and continuous routes that we climbed. 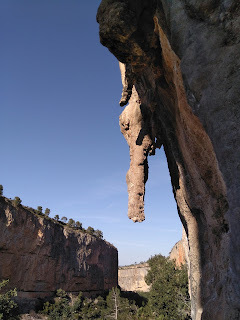 The first pitch is graded 6c and according to the guidebook it's quite fingery, so we decided to skip it and just enjoy the other 5 pitches of 6a/+. Easy access, nice view, solid rock quality and quite consistent climbing all the way to the top. Those are the things that stuck to my mind about Ticket Danger. If you're up for something harder, there are plenty of routes to choose from, too. There are even some single pitch routes as well, if you absolutely must get some cranking done. The exposed feeling doesn't end until after the final anchor. No matter what you're climbing, respect the vultures and let them nest in peace. There seems to be a horde of these grim scavengers flying and nesting in the gorge, which is obviously their home. It means, that during their nesting period in the spring/summer some of the routes might be out of use in order to give the vultures some privacy to grow their chicks. At least in 2018 sector Saut d'Homme had many routes, where climbing was banned from January until the end of August. Saut d'Homme (6a) is a nice route, but don't climb it just because they say it's off width in the topo. So... 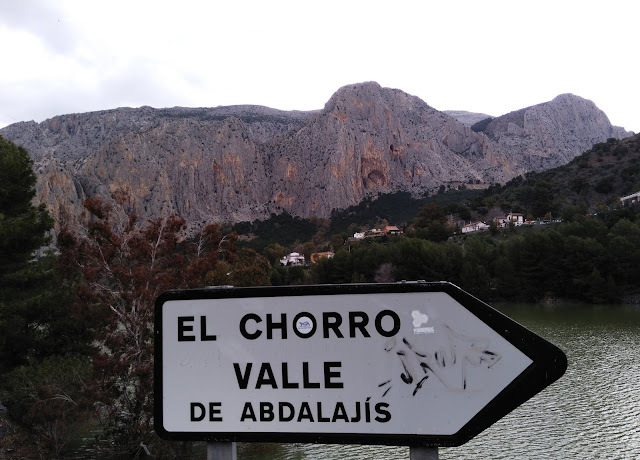 Exposed multipitch climbing, grumpy looking vultures, a well equipped climbing shop, easy access and ok camping. 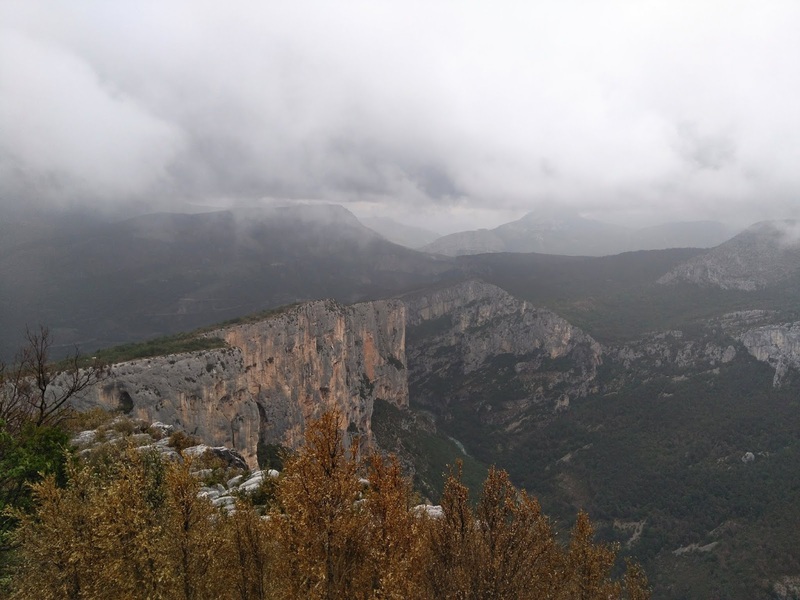 What else is there in Verdon? Well, some small boutiques selling local products such as lavender, mustard, olive paste and beer. Lavender is the big thing in Verdon and they are growing it on huge fields around the village. I actually heard, that they are even selling lavender ice cream! Sounds weird, which is why I must try it. Right now I have a feeling that we only saw one tiny bit of Verdon, though. Next time I go there, I'll book at least a four-week holiday and definitely equip myself with a better camera.